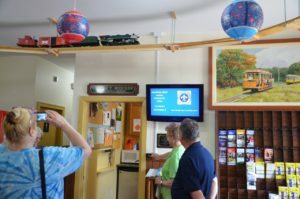 On Saturday April 29th the Shore Line Trolley Museum dedicated a “G” scale train and track display in memory of past Board member Leander “Lee” Lagerstrom. The display includes track from Lee’s own collection donated by his wife Shirley. The track was installed by the the New Haven Model Railroad Engineers. The members of the railroad engineers worked many hours to erect the tribute to Lee who was a member of the engineers. Lee was active in both organizations and both organizations felt it would be a proper tribute to Lee to have his cars running on his track for all to see. The track is operated by a push button that allows the train to run for two minutes. The button is located just right for young children to be able to operate the train. The engine and cars were part of Lee’s collection and make one complete loop in the two minutes.